Look at me. Please, L O O K A T M E!!! Don’t divide your attention with someone who’s not even in the same room as us. We’re communing, you and I, exchanging ideas or simply “hanging out” with each other, coming together because we have so many things in common. Don’t let someone else interrupt what we’re doing together. And it is an interruption. Everytime you focus away from me and toward that device in your pocket or hanging from your belt, you’re choosing to give someone else the time I believed we were giving each other. It’s not like the other person has such critical earth-shattering information that some catastrophic harm will befall mankind if you don’t attend to the message immediately. Rarely is any message so urgent that it can’t be dealt with later in private, away from me or the person you’re “with” in a given moment. I feel “dissed,” — disrespected. I give you the respect I expect you to give me in return. I try to make eye-contact and converse with you about topics we mutually find important, entertaining, informative or all the above. I turn off the TV when we meet in my living room. I pause, save and put away the video game when we talk, unless we had agreed to play together. I stop any chore or task I’m engaged in so that I can give “my all” to you when we come together. It’s not just the courteous thing to do, but the most compassionate I can offer to show how much being face-to-face means to me. So, S T O P T E X T — M E S S A G I N G!!! P L E A S E!!! Hoping you receive my message! Don’t turn your eyes away from me and towards that tiny screen on your cell phone, iPad or other communications device. You got a human communications device right in front of you — one that doesn’t mind sharing you with the rest of the world but not every minute you receive one buzz after another demanding you stop what you are doing and give your attention to some uninvited urgent messenger. It’s not as if you’re awaiting word on someone going into labor or a call-back on a job interview. Heck, I’d gladly share you with another under those circumstances. You would too, particularly, if I told you ahead of time that I was awaiting such a call. It would be something I know we’d talk about, commiserate with, and develop stronger bonds in the sharing. But you insult and belittle me when the insignificant prods you away from me. At least, that’s how I feel when we’re talking and I look and see you reading someone else’s words when the whole time we came together were to share our words. Why do you think they are more important than me? How many times can someone– can I — take this slight before telling you how much it bothers me? How much it irritates me . . . How much it pains me. Maybe you’ll get the message if I send it by text to you with no forwarding address. This entry was posted in anger and tagged compassion, conversations, face-to-face, friends, heartfelt, message, messages, musings, relationships, talking, text-messaging. You, dear mittaipink, have offered a message I hope they never take the text away! You just wrote the article I was thinking about writing, Michael J. Know what’s so sad? The people who are doing it haven’t got a clue that they are hurting another human being. If someone directs them to this article, they’ll just think of other people who do this sort of thing. I see couples, friends, families doing this to one another all the time. I also don’t want to be a time-filler. Don’t call me when driving, waiting in line or doing any other activity that is an opportunity to be alone with self and thoughts. “If you cannot be alone with yourself for even an hour, what makes you think others want you for the other 23 hours?” – quote Soul Dipper. It breaks my heart to see parents doing this “dissing” to children. The child has a burning question and guess what the adult is doing. Any wonder the child learns how to whine, snivel and cry? There’s no love in this behaviour folks. You are going to “diss” yourself right out of relationships. You have a way with words, my dear Amy. You’ve identified a fear I believe many people have who try to compensate for it by never wanting to face themselves alone. Personally, I like it. There is so much Life in silence, stillness and the joy one can only discover within. Hold the phone, please, until I’m finished messaging inside here. I have to say – the whole messaging thing drives me INSANE! It is SO damned rude and disrespectful to turn away from someone and text or talk on that bloody phone when they are RIGHT there! People have these things at work and spend at least three hours a day being paid for NOT paying attention to what they are being paid to do! There are times when texting is appropriate – it is never appropriate to interrupt a face to face conversation to text a casual acquaintance IMHO. If someone is dying or giving birth I can see it as ok – but other than that…just wait and pay attention to what you are doing and to whom you are doing it with. “Pay attention” is the operative phrase here, M.L. Many have difficultly being able to focus on one thing when there is so many other things going on around ’em. It takes self-control and knowledge of what really is important in life to concentrate on a single task, person or even a thought. When they do, they’ll realize there is nothing more satisfying than to live in the moment and love the moment they’re living in. I went to lunch with a “friend” – we worked in the same building – and at lunch her face was stuck on her Blackberry (also called Crackberry for what I think are obvious reasons.) She wasn’t engaged with me at all. I would say something and she’d look up and ask, “What?” So I would repeat myself and she’d barely respond before going back to her device. The third time this happened, I got up and walked out. I don’t even think she noticed. Seriously, she never came to my desk later that day, she never acknowledged that I had left lunch. Suffice it to say: our friendship did not bloom. I won’t get upset about it anymore. I will just get up and walk away. Period. If I can put my phone on silent mode when we get together, so can you. Nothing is as important as this very moment. I understand and can relate to the disrespect that I would feel in a similar situation. But I also feel bad for someone who can not enjoy the moment they have face-to-face with another person of whom life has brought together. Who knows what could have “bloomed” if both of you chose to live without such outside interference? Unless there is something so important that it cannot wait, I can see no reason someone could not silence their communication device while engaged with another person. You prove my point, Susan, and that is there is a way to handle new technology in a humane way. Show consideration to the person we are face-to-face with and they will appreciate us much more for including them in our mutual world. We show them how much we value them, and that only something reasonably urgent and necessary would disrrupt our time together. Saint Susan. I like the sound of that. You can be the first, the patron saint of cell-phone etiquette. I had a family member one year over for Christmas. We hardly see this person as it is, and what did she do…………text! I finally said something and she put it away. Yes, being in the moment and giving the undivided attention means so much. I ask my 19-year-old son to look me in the eye when we’re talking and I see him gaze at his cell phone manipulating the tiny keyboard while trying to multi-task with his old man. He’s getting better at it. But I have yet to bring it to the attention of others who don’t realize their texting while talking to me devalues my importance to them. They’d rather spend time with the messenger somewhere else, than with the warm-blooded schmuck standing right next to ’em. I am giving this a five star award! I am fed up with human dronoids walking around fumbling with their fingers on mini typewriters in the store, in the car and on the phone when they diss me because someone is texting them. Texting is an addiction, an insult to human intelligence, and a horror. No thank you to texting! Thumbs up to that- I smashed my cell phone three years ago- don’t want to have my life interupted by unwanted messages about nothing important. Email from friends or a phone call is adequate. Nothing worse than having guests for dinner and one of them getting up to answer “an important call or text message”. It’s just plain rude. I know I belong to a rare subspecie of the human race, not having a cell phone, but it gives me time to smell the flowers and enjoy my life uninterupted by modern technology. Someone should provide a course in high school, or even middle school to share with students a more humane understanding of communicating in our society. 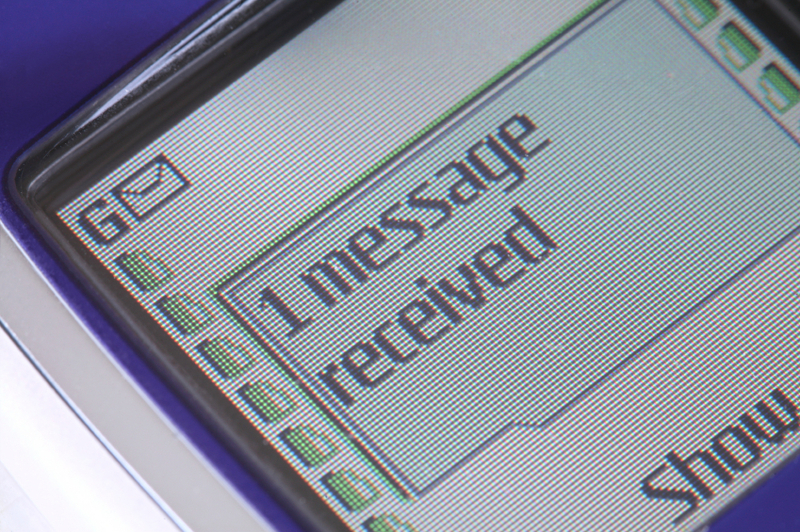 Do you think people who text-message are aware how their actions effect others? I know there are people who want to “kick” the messaging habit. I just read a friend’s attempt to stop reaching for her cell phone the moment she awakes from sleeping in the morning . . . It must be terrible to have this constant barrage of messages, particularly if you have dozens of friends (Aren’t they more like acquaintances, “text-messaging” acquantances”?) who get so excited about something they feel they must share it with others. All the time. Day or night. Whether the other person is at work or play. All right. I’m done ranting. It’s time for me to enter a cave and leave civilization for a few quiet and uninterrupted moments of a less noisy life. Texting is a generational thing. Livvy. I can see how easily someone could get hooked on always needing “to know” something new from one message to the other. How many hours did those of us growing up in the 60s spend on the phone talking about nothing but the most important things in our teenage and pre-teen years? Our parents and other adults just didn’t get it. How could they? They never went through anything quite like what we had experienced, did they? Or did they — or we — just not remember?